In the United States, some populations suffer from far greater disparities in health than others. Those disparities are caused not only by fundamental differences in health status across segments of the population, but also because of inequities in factors that impact health status, so-called determinants of health. Only part of an individual’s health status depends on his or her behavior and choice; community-wide problems like poverty, unemployment, poor education, inadequate housing, poor public transportation, interpersonal violence, and decaying neighborhoods also contribute to health inequities, as well as the historic and ongoing interplay of structures, policies, and norms that shape lives. When these factors are not optimal in a community, it does not mean they are intractable: such inequities can be mitigated by social policies that can shape health in powerful ways. 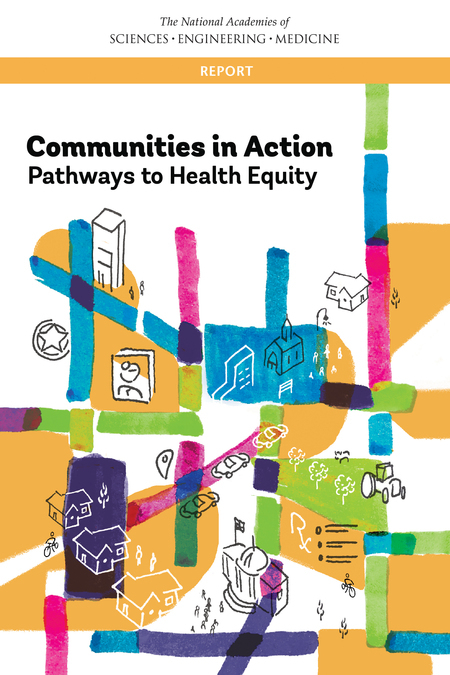 Communities in Action: Pathways to Health Equity seeks to delineate the causes of and the solutions to health inequities in the United States. This report focuses on what communities can do to promote health equity, what actions are needed by the many and varied stakeholders that are part of communities or support them, as well as the root causes and structural barriers that need to be overcome.